One bookcase, very different looks. First shelf: Deco border rectangle box, $115/Global Views; alcohol available at Goody Goody; lacquered box, $115/Mecox; black-and-white drawing by Deanna Kienast, $300/Mecox. Second shelf: Crosshatch cylinder decanter, $149/Global Views; Crosshatch cone decanter; $149/Global Views; Crosshatch finial decanter, $299/Global Views; agate tray, $340/Blue Print; shell tray, $345/Laura Lee Clark; circle etched glasses, $65 for set of 6/Blue Print. Third shelf: Geometric object, $29/West Elm; pedestal stone box, $49/ West Elm; brass paperweight, $69/Global Views; acrylic petrified wood bookends, to the trade/Made Goods; brass gazelle bookends, $175/Global Views; sculptural sphere, $29/West Elm. Fourth shelf: Gold cube, to the trade/Made Goods; black journal, stylist’s own; black-and-white drawing by Deanna Kienast, $300/Mecox; hand sculpture, $120/Laura Lee Clark; lacquered punk-rock box with rock mineral points, $225/Mecox. Fifth shelf: Acrylic box, $49/Wisteria; beads (inside box), stylist’s own; tubular metal burst object with stone base, $375/Global Views; antiqued white-parchment-covered books, $35 each/Laura Lee Clark; brass gazelle bookends, $175 for the pair/Global Views. Sixth shelf: Antiqued white-parchment-covered books, $35 each/Laura Lee Clark; black-and-white box; $395/Mecox. 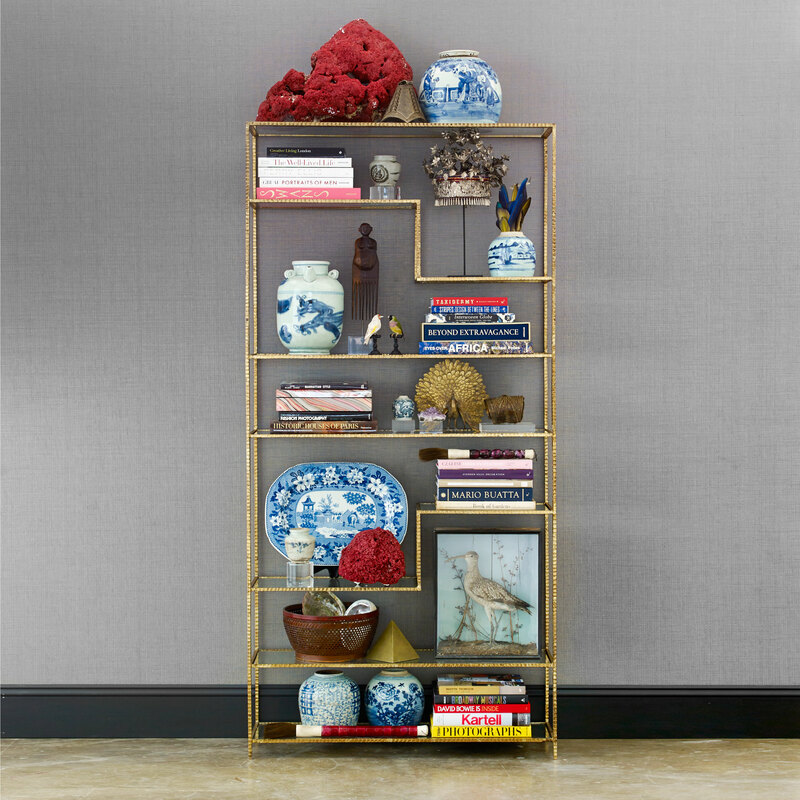 Bookshelf: Worcester Bookshelf, to the trade at Arteriors. Wallpaper: Mitsu Weave in pewter by Schumacher. Books: Courtesy of Nest, Laura Lee Clark, and our stylists’ real bookshelves. Our challenge brought back some fond memories for Billy. “My mother always had me arrange the bookshelves when I was younger. She would say, ‘You’re much better at this. You just do it.’ So I’ve had lots of practice,” he says. The vibe of his bookcase is so Billy—fun, colorful, and full of robots. “I brought in several things from home. That gold robot from Nest went perfectly with the robot stuff I brought in,” he says. Arrange a search party. Billy recommends Curiosities, Lula B’s, and White Elephant in town. Check out New York’s flea markets and Antiques & Beyond in Atlanta. First shelf: White-and-orange hinged lacquered box, $225/Mecox; yellow vase, $90/Mecox; gummy bear by Charlotte Olympia,$1,600/Neiman Marcus NorthPark; foundry molds, $50-$250/Life of Riley. Second shelf: Foundry molds, $50-$250/Life of Riley; turquoise object, $29/West Elm; silver bird by Brad Oldham, stylist’s own; gold robot, $115/Nest; colored box, stylist’s own; Toikka glass birds, $450–$600/Nasher Museum Store. Third shelf: Drawing Studies, $395 for set of three objects/Mecox; little robots and Red Ranger ray guns, stylist’s own; string balls and levels, stylist’s own. Fourth and Fifth shelves: Figurines and pharmacy bottles, stylist’s own. Sixth shelf: Small woven square baskets, $24 each/Wisteria. Ashley sums up her bookcase with two words: “Fantasy fashion. Contain yourself. You have pretty jewelry. Why not store it in something equally pretty? Consider the colorful—and reasonably priced—selection of lacquer boxes at The Container Store. Shop like Ashley. Check out West Elm, Neiman Marcus, River Regency, and estate sales. “I’ve spent many Saturdays combing estate sales. They are the best,” she says. Top shelf: Lacquer box, $225/Mecox; sphere, $39/West Elm. First shelf: Bowls, $8 each/West Elm; lacquer box, $24/West Elm; skull, $48/Gallerie Noir; porcelain vase (stand not included), $475/Ceylon et Cie.
Second shelf: Turquoise object, $29/West Elm; bookends, to the trade/Made Goods; Fendi Diamond-heel pumps, $690/Neiman Marcus NorthPark; YSL Cassandre crossbody handbag, $1,750/Neiman Marcus NorthPark; deco border square box, $89/Global Views; clearlight orb, $199/Global Views. Third shelf: Stone box, $49/West Elm; Caitlin round basket, $60/Crate & Barrel; scarf, stylists’s own; decorative swirl box, $395/Mecox. Fourth shelf: Brass pyramid, $375/Mecox; Nancy Gonzalez crocodile tote, $3,100/Neiman Marcus NorthPark; acrylic charm bowl, $375/Jonathan Adler; sunglasses, stylist’s own. 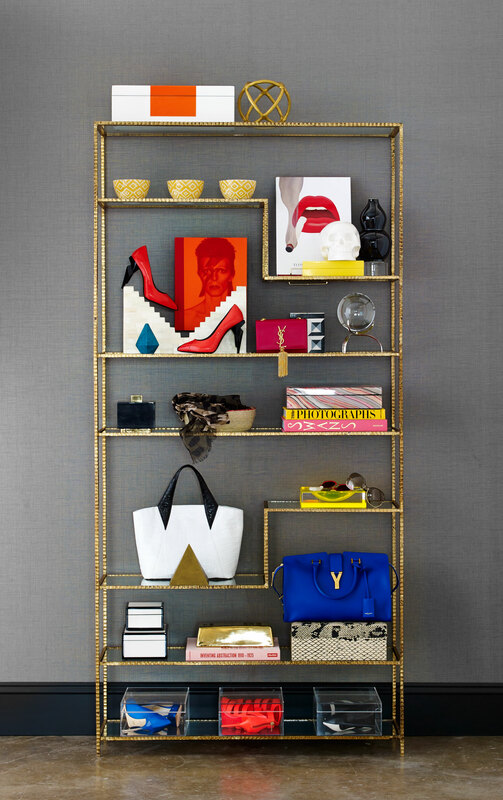 Fifth shelf: Black-and-white boxes; $95–$115/Mecox; gold-brick piggy bank, $48/Gallerie Noir; Y-Ligne Classic Cabas Carryall Bag by YSL, $2,695/Neiman Marcus NorthPark; faux snake box, to the trade/Made Goods. Sixth shelf: Acrylic boxes, $49 each/Wisteria; Fendi Diamond-Heel pumps, $690/Neiman Marcus NorthPark; Jimmy Choo Dame Caged booties, $995/Neiman Marcus NorthPark; Saint Laurent Paris Lightning pumps, $875/Neiman Marcus NorthPark. To consign is fine. “Fortunately and unfortunately, this is a disposable town when it comes to possessions. You can score stuff here that you wouldn’t be able to in other markets. These are items that would traditionally be handed down through generations. I’m always shocked when I go to our consignment shops and see what’s sitting there,” he says. Set up a treasure hunt. Take some trips to Round Top, Broomfield, and the flea markets in New York City. Top shelf: Coral, stylist’s own; bell currency, $800/Laura Lee Clark; Chinese lidded jar, $89/Wisteria. First shelf: Ming pot with acrylic stand, $150 and $130/Blue Print; small Maio opera crown on custom iron stand, $1,457/Ceylon et Cie; small Asian pot with feathers, stylist’s own. Second shelf: Blue dragon jar with spout, $175/Laura Lee Clark; antique Makonde comb from Zimbabwe’s Bantu tribe, $845/Ceylon et Cie; taxidermied birds, stylist’s own. Third shelf: Decorative swirl box, $395/Mecox; covered Ming pot on acrylic, $120/Laura Lee Clark; large vintage brass peacocks with fan tail feathers, $695 for the pair/Mecox; amethyst on Lucite base, $225/Mecox; currency Congo, $500/Laura Lee Clark. Fourth shelf: Ming pot on acrylic stand, $150 and $130/Blue Print; large transferware platter on stand, stylist’s own; red coral, stylist’s own; calligraphy brush, $55/Blue Print. Fifth shelf: Basket filled with sea shells, stylist’s own; vintage brass pyramid, $395/Mecox; painting of bird, stylist’s own. Sixth shelf: Asian blue-and-white pots, stylist’s own; calligraphy brush, $55/Blue Print.